While waiting at the station in Malmö I browsed the PocketShop store. I often do that, browse a book store without intent to buy anything. Books matter to me and give me a lot. 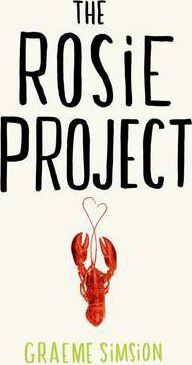 I noticed “The Rosie Project” book and picked it up. It’s marketed as fun and entertaining. A quick look inside supported that, I bought the book as a fun read. Little did I know that the book would mean a lot more to me. Love isn’t an exact science – but no one told Dan Tillman. A handsome thirty-nine-year-old geneticist, Don’s never had a second date. So he derives The Wife Project, a scientific test to find the perfect partner. Enter Rosie – the world’s most incompatible woman – throwing Don’s safe, ordered life into chaos. Just what is this unsettling, alien emotion he’s feeling? Don, the main character, is a control freak (in my eyes). He lives a very strictly planned life, routines are king. Don has for instance a weekly dinner plan that’s repeated each and every week. He has many logical reasons for that. Don also is socially awkward, he’s lousy at picking up cues and goes through life sometimes acting more like a robot. When I discussed the book with a friend I realized what made the book itch. Don is an exaggerated version of how I’ve been (and sometimes still am). The book mirrored some of my own experiences in life. My friend suggested that I should read the book with that in mind. This turned the book into a personal development book for me. The book shows me, again, the power of stories. Lessons included in a story are much easier to grasp than a more fact based approach. It’s OK to be wired differently. Too much thinking complicates things and life. Life works better when we drop the excessive parts of our planning. What brightens our lives is often the unexpected events, people we meet because we open up. When great things happen – trust your guts and enjoy them! Posted on January 30, 2014 by BengtPosted in Discover Your SelfTagged Books, Change, Review.